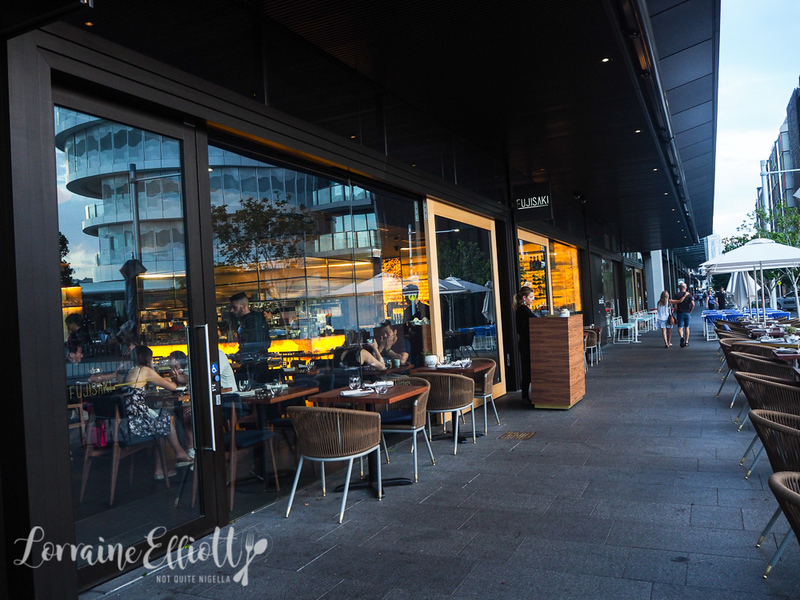 The restaurant openings at Barangaroo never stop and Fujisaki is one of the latest restaurant openings. 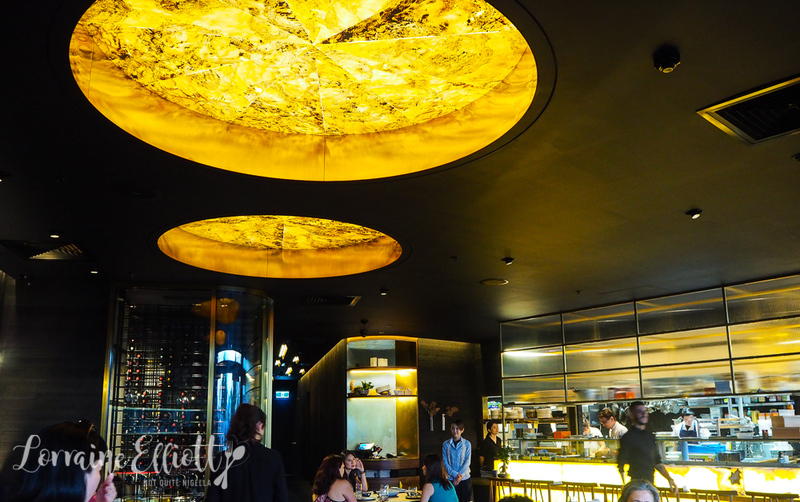 Here executive chef Chui Lee Luk and sushi chef Ryuichi Yoshii craft Japanese food with a light native Australian touch. It's a hot 43°C day in Sydney and our booking to sit outside with Mochi is suddenly looking untenable. After asking a dozen people if they can dog sit to no avail, my father steps in and offers to look after Mochi at home. Unlike the rest of my family who are obsessed with Japanese food, he isn't a huge fan of the raw element and he'd much rather be at home as he is not a very social soul. Chui's research for Fujisaki involved a recent trip to Japan. She says, "In preparation for the opening of Fujisaki, I was able to fit in a fact-finding trip to Tokyo. At that time, I was lucky to experience the matsutake season. What inspires me about Japanese cuisine is the attention placed on detail and nothing is done without conscious intention." 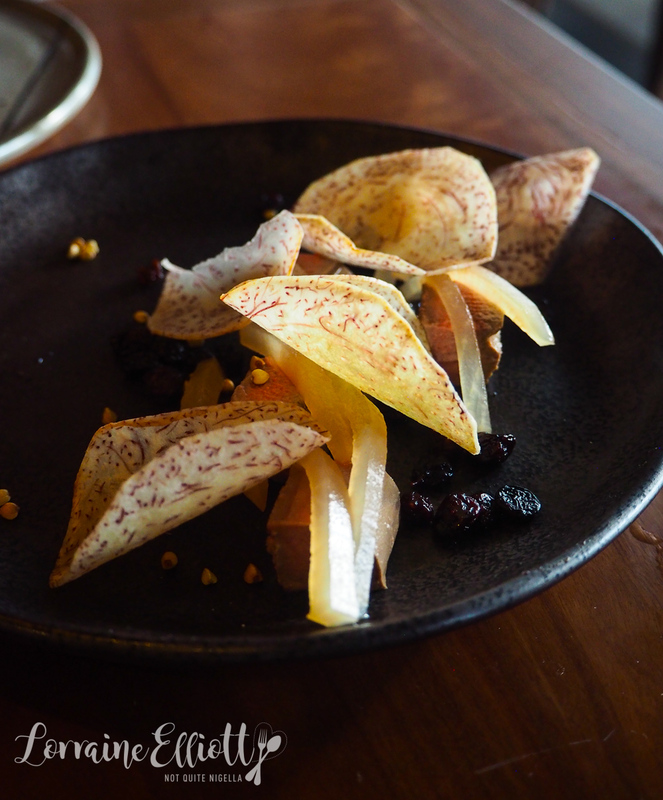 The native ingredients on the menu were also inspired by her trip. "One of the main characteristics of Japanese cuisine is the use of ingredients at their best and understanding how terrain and climate affect the nature of ingredients. My aim with the menu is to feature this as much as possible with the judicious inclusion of native ingredients," Chui says. We arrive at Fujisaki located at the North end of the Barangaroo development. The greeting podium is outside and we tell them our booking details. The hostess asks us to wait a moment to check on our table's readiness which is a little unusual given that it's a 6pm booking and there are only three tables of people dining. "It's a very hot day," she says smiling at us while we wait. We couldn't agree more and all of us wonder why we are standing outside in the heat when we could be waiting inside. After a couple of minutes we are allowed into the air conditioned coolness of the restaurant itself. It's a beautiful looking space with recessed ceiling skylights with a backlit slate veneer and silvery black charred cedar timber wood panels called shou sugi ban. There's a 300 plus wine list in the wine room off to one side. There is also an open kitchen with the large robata grill. Our waiter is very friendly and nothing is ever a problem. 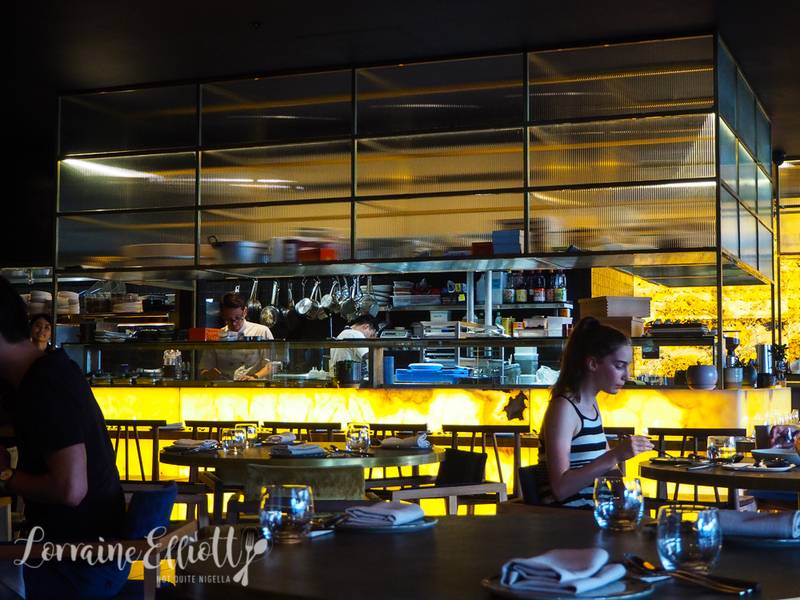 We go through the whole menu picking everything that piques our interest. The sea urchin roe dish is the first to arrive. 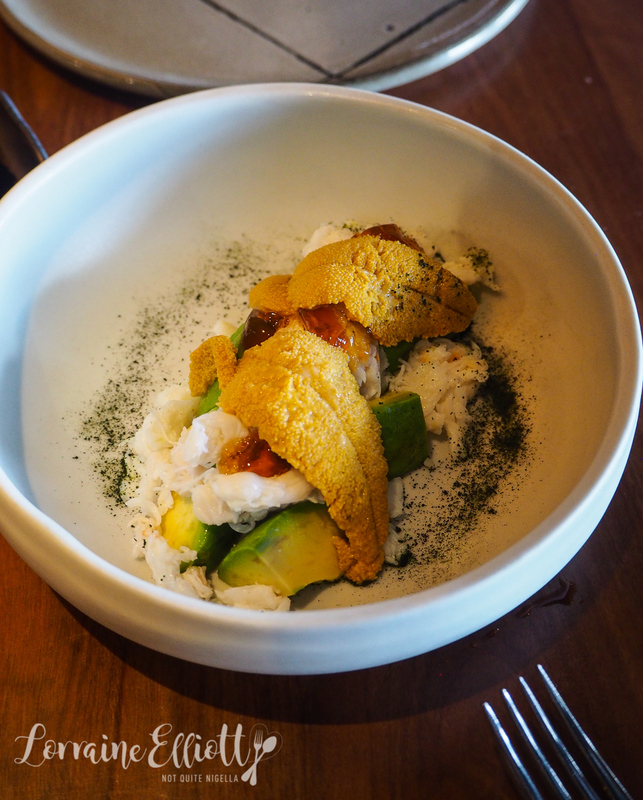 There is sweet spanner crab meat, chunks of avocado, ginger and dashi jelly with two pieces of sea urchin draped over the top. It's a delicately lovely dish with all elements working together. The chicken liver and umeshu parfait comes out next and it's a deconstructed liver parfait with taro chips, chicken liver parfait and umeshu marinated currants. It's creamy, crunchy with sweet pops from the currants. 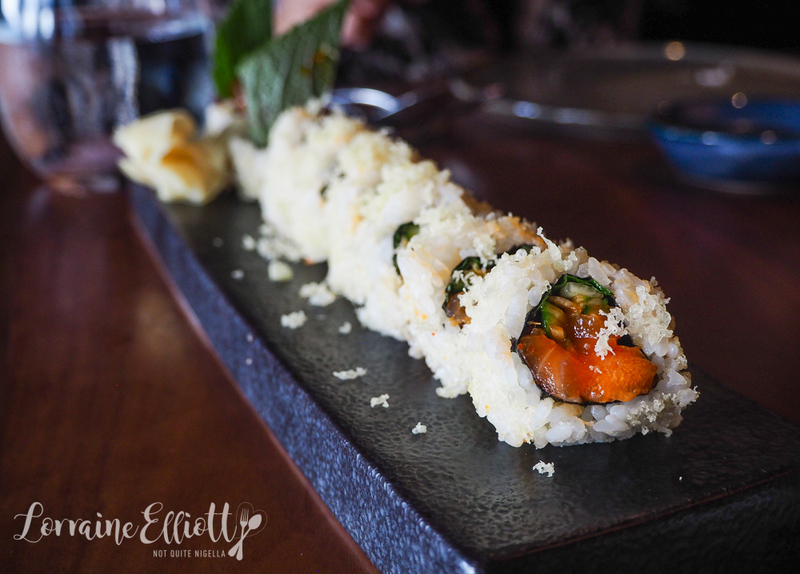 The spicy ocean roll is filled with salmon, kingfish and tuna and fermented chilli sauce and is wrapped in tempura crumbs. It's nice with the crumbs giving the maki roll pieces texture. There are two pieces with half a shiso leaf tucked into them and I really liked these pieces better. 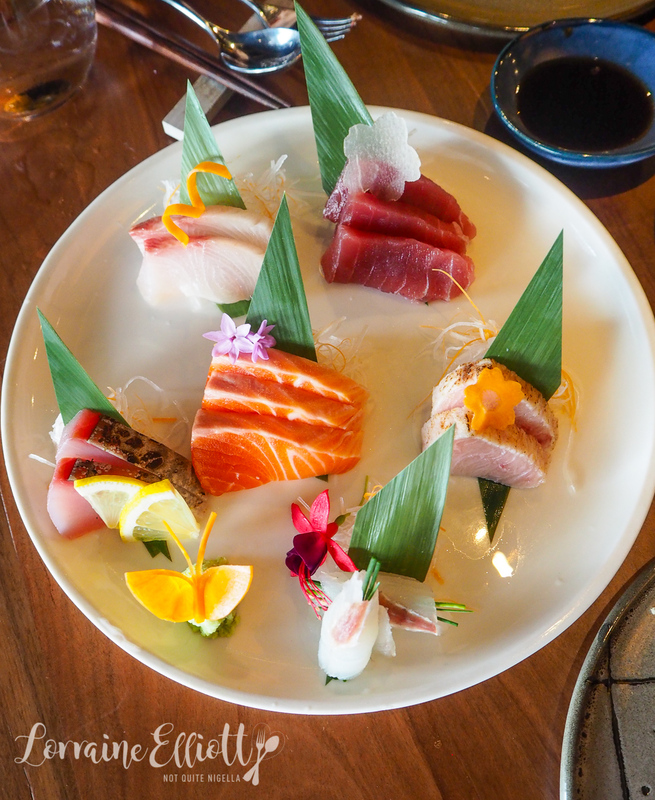 One of our favourite items is the sashimi selection. There's salmon, tuna, swordfish, kingfish and whiting rolled up with chives. All of the fish is fantastic but the stand outs are the aburi swordfish which is luscious and the tuna that melts in the mouth. There is a deep fried section of three items and knowing my mother's predilection for deep fried foods, we order two of them. 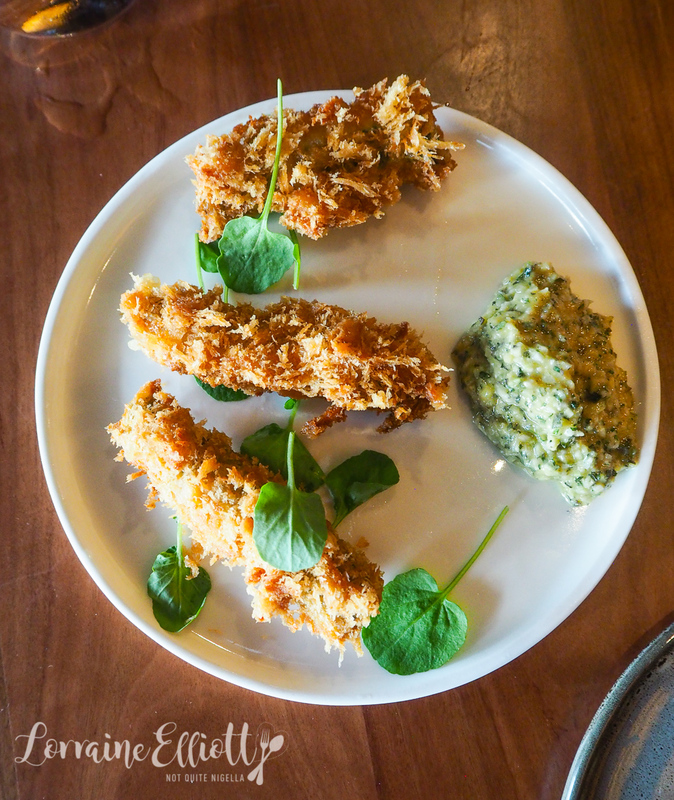 There are three crumbed sardines flavoured with scallions, ginger and lime zest that are crunchy and golden with a cucumber and lemon sauce. I'm not such a huge fan of the sauce so I gave the rest of my sardine to Mr NQN. 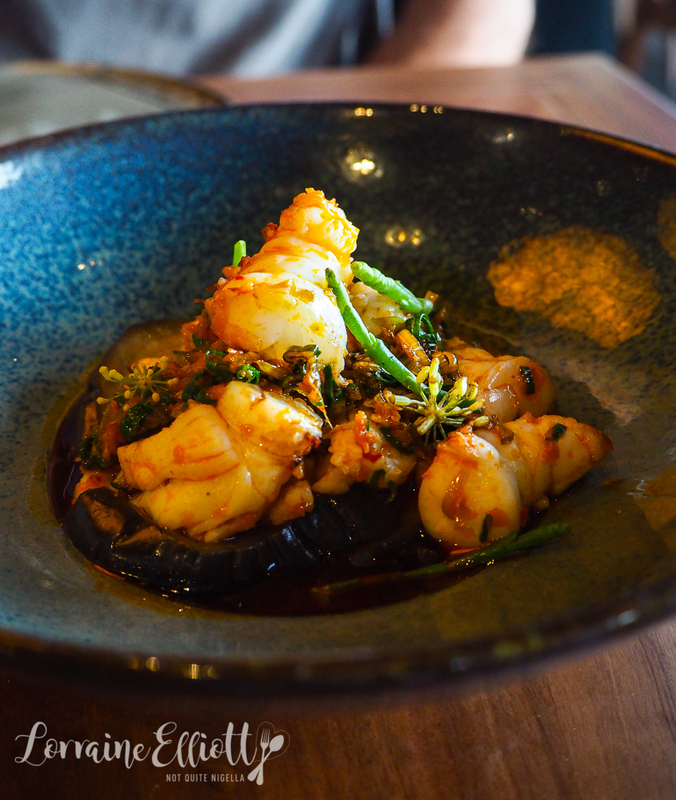 What is tastier is the prawn kakiage, a prawn, carrot, ginger and corn roll with sancho pepper, mizuna leaves and a creamy, sweet lemon tofu sauce. 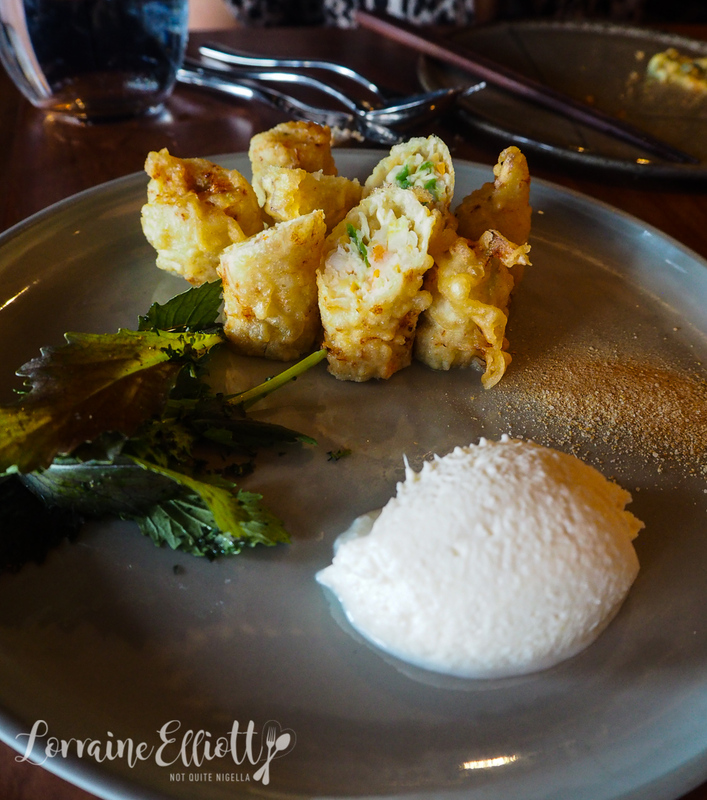 The sauce is surprisingly sweet but its creaminess goes nicely with deep fried crunchy pieces. Whenever my London-based sister comes back to Sydney she wants to try certain foods that she can't get in London. Moreton Bay bugs are one of them. These are done on the Robata Grill and have almost a Chinese flavour to them with ginger and the karkalla succulent(you might also know it as pigface or beach banana). It's full flavoured and saucy and just begs some rice to soak up the thick sauce. There isn't any rice on the menu apart from sushi so at this point we're quite relieved that my rice obsessed father didn't come because he might be beside himself. 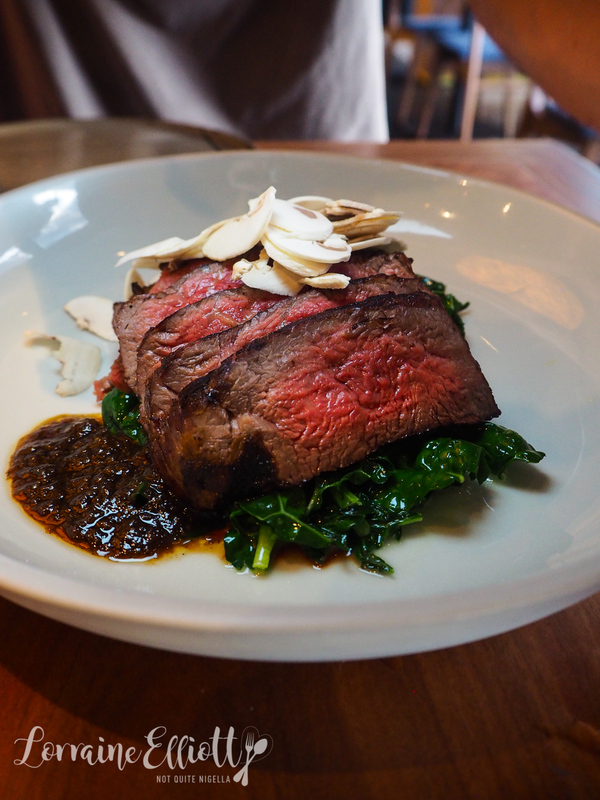 I really liked both robata dishes and the Angus beef from Victoria is luscious, cooked medium rare (much to my mother's alarm), and is served with a divine black pepper sauce, thinly sliced raw mushrooms and cavalo nero or Tuscan kale. The beef is marinated in hacho or red miso. Again the only thing missing is a carb of some sort or rice to go with it. Because servings are on the petite side, we decided to order another maki roll. This one is my favourite of the two that we tried. It's filled with spanner crab, mayonnaise and wrapped in burnt cabbage with tobiko or flying fish roe on top. I love the flavours and textures here. We were going home for cake so we decide to share one dessert (although truthfully I wanted to try all of them). The waiter recommends the sweet wasabi. At first I am not overly keen on the idea as I'm not a big fan of wasabi but he explains that there isn't any wasabi in it at all. This is their dedicated pastry chef's Kumiko Endo signature dessert. 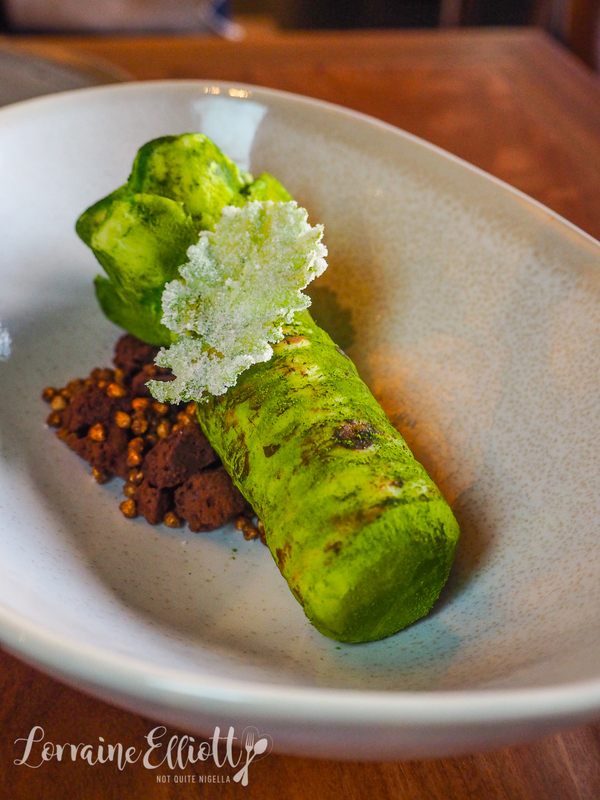 It's a white chocolate mousse filled with mango, wrapped in thin white chocolate shaped to look like a wasabi root on a dark chocolate crumble soil. Not a crumb goes back to the kitchen. 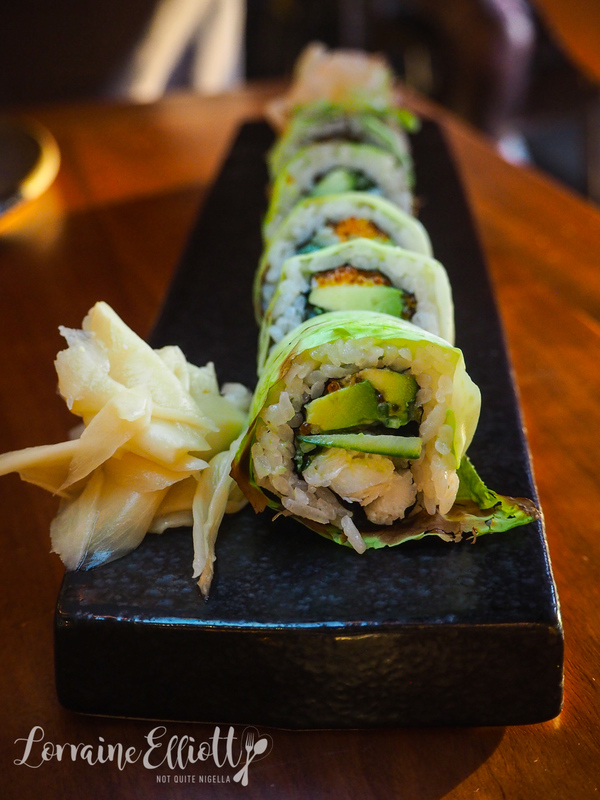 So tell me Dear Reader, are you a wasabi lover? Do you know anyone that is happier eating at home rather than eating out? restaurantGogyo Ramen Arrives in Sydney! restaurant Gogyo Ramen Arrives in Sydney!